If you are into adventure sports like trekking, you are probably keen to find out wallet-friendly the best trekking shoes in India. Searching for a pair of waterproof trekking shoe is not that easy as it seems to be. Although, the Internet is flooded with reviews and price ranges. Of course, you must have a budget. But at the same time, it is also important to know why you should go for a little higher range. Above all, you are a frequent trekker, and a pair of right trekking shoe is an investment for a long time. 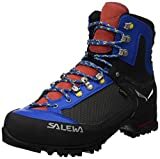 In addition to that, when you are searching for the best shoes for Himalayan trekking, you also understand that you are investing the money not only for the longevity of the boots but your safety too. First, you need to understand that what you should look for the best trekking shoes in India. While, in the review, I have also mentioned best trekking shoes under 3000 for those who want to keep the budget pocket-friendly. But my advice is that if you have a passion for trekking and frequently you plan for the high altitude Himalayan trekking, you must push up your budget a little more to get the best trekking shoes in India. Along with your passion, ensure your safety as well. Although trekking and hiking in India have been used synonymously, there is a technical difference between trekking vs. hiking. Hiking is considerably more leisure activity. It defines a single day or a shorter period of walking on an easy trail. The trail on hiking may be human-made or easier. On the other hand, trekking is more strenuous activity. Mostly trekking is a multi-day affair in the mountain. Moreover, it lasts more than a week. You have to cover any terrain(maybe an alpine trail or maybe backcountry trail). As a ma, the trekkers need to be fit for several days walking at higher altitude. In trekking, as there are multiple types of terrain – alpine, rocky boulders, moraine, etc. Therefore, you need to have a good grip, sturdy, light-weight and waterproof trekking shoes for your safety. Why you need best shoes for Himalayan trekking? As you are planning for multi-day trekking in Himalaya, eventually, you have to be prepared for any condition of the route. Sometimes rocky trails are very slippery after the rain. You need a good grip of trekking shoes. While descending, your ankles tolerate more pressures of the body. With this in mind high-ankle shoes are effective to save your ankles from injury. Do you really need trekking shoes? If you are planning for a trek, you must invest for a good pair of trekking shoe. Believe me. It is worth investing. The best shoes for Himalayan trekking are the best for not only the rugged soles but also they support your toe and ankle for a more extended period of climbing. The upper part of the excellent trekking shoes is made of synthetic and breathable materials. In addition to that, there is also water-repelling coating which helps your feet not to get wet in the heavy rain too. First of all, proper ventilation is mandated for your shoes. It repels to get affected by blisters after prolonged walking. Secondly, high ankle shoes are beneficial to avoid injury. Especially in the time of descending, high ankle trekking shoes are offering extra support for grip and balance. In Himalaya, the weather is very moody. Anytime you may face rain. Water-repellent boots are the must for trekking in upper Himalaya. At high altitude, waterproof trekking shoes are an indispensable part of your adventure. You should ensure that the size of the trekking shoes should be half size bigger than your usual shoe size. For example, if your size is UK 8 for trekking shoe, you must prefer 8.5. If you are in the colder zone in the high altitude, you may have to wear another layer of socks. In high altitude, the blood flow increases in your toe. It is because your toe muscle needs more oxygen for continuous walking. Naturally, your toe is swollen a bit. A little more space inside your shoe makes it comfortable. Men's Hiking Shoes NH100 Mid - Black - This shoe is made for easy treks for the beginner at dry weather condition. It is affordable and has a good grip. Equipped with Cross Contact technology and thermoplastic sole, this shoe will assist you to move forward on the hiking terrain. High ankle will provide extra support to knees while descending. Is it waterproof? It is partially waterproof. It’s a good looking, comfortable and rugged pair of shoes. Is it waterproof? It is breathable. Padding inside is really good and comfortable for the feet. 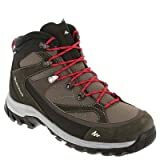 Men’s Snow Hiking Shoes SH520 X-Warm Mid - Black - This is a waterproof and warm boots for hiking. Apart from that, it has an excellent Snowcontact grip on the snowy terrain. You have the less possibility of slipping on the tough terrain with the excellent grip of the shoes. 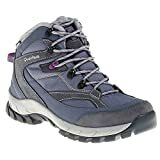 Men's Mountain Hiking Shoes MH500 Mid Waterproof - Grey - This shoe is made for all weather mountain hiking. Even it is fit for the technical trail. With EvoFit technology, you can trek safely with stone guard, waterproof membrane and good grip. Even on the slippery rocky terrain, you have the confidence to hike. Trek 100 Waterproof Men Trekking Shoes - It is comfortable and light-weight hiking shoe with breathable waterproof membrane and excellent grip. This is a state of the art boot for any trail. Serious trekkers will surely enjoy the superior quality while trekking. Even on the tough surface, this trekking shoe helps you to perform. Traction: Rubber sole with 5mm stud. Waterproofing: Novadry Concept, more breathability. Support: High upper in split leather and polyester. Does it feel heavy? Not at all. It is a light-weighted shoe, ideal for trekking. It contains water-resistant textile and waterproof PU coated leather. Mud-guard elements has been placed on the base and it protects mud and dust. The heel cap of the shoe puts comfort to the ankle and ensures foot stability. Protective rubber toe cap assist for foot stability and comfort. Quicklace helps you to tighten the shoelace effectively. Are they Indian or imported? They are imported. Is there any warranty? Yes, there is warranty for one year for any manufacturing defect and three months on wear/tear on the discretion of the brand. It is applicable if bought from Amazon. 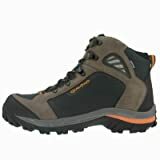 Trek 500 Waterproof Men Trekking Shoes - This trekking shoe is built for the serious mountain trekkers. It is comfortable and light-weight hiking shoe with breathable waterproof membrane and it offers you an excellent grip at any surface. It is an excellent shoe for all weather condition. Traction : 5 mm lugged Essensole rubber sole for good traction. Cushioning : Full-foot EVA midsole: durable and high-performance. Trek 700 Waterproof Men Trekking Shoes - This trekking shoe is made for the experienced trekkers for any expedition. It is comfortable and light-weight hiking shoe with breathable waterproof membrane and excellent grip. It is an excellent shoe for all weather condition. OutDry membrane is completely waterproof. Tapered HP3 midsole and shock absorbing PU have been installed under the heel to absorb shock during climbing. This shoe pair weight 2050 gms.